After a review of the literature on electronic discourse (ED), including research from teacher education and several other academic fields, the authors describe an investigation of the efficacy of integrating electronic discussion sites into an elementary language arts methods class. Findings from students' pre and postdiscussion dispositions and perceptions of the experience are presented. Instructor notes and analysis of online discussion contributions are used to provide context and illuminate findings. Findings are then discussed in view of the existing research on ED. Killian, J. & Willhite, G.L. (2003). Electronic Discourse in Preservice Teacher Preparation. Journal of Technology and Teacher Education, 11 (3), 377-395. Norfolk, VA: Society for Information Technology & Teacher Education. Retrieved April 26, 2019 from https://www.learntechlib.org/primary/p/14611/. Creed, T. (1997). Extending the classroom walls electronically. In W. Campbell& K. Smith (Eds.) , New paradigms for college teaching. (pp. 149-184). Edina , MN: Interaction Book Company. Harasim, L. (2000). Shift happens: Online education as a new paradigm in learning. Internet and Higher Education, 3(1-2) , 41-61. Slavit, D. (2002). Expanding classroom discussion with an online medium. 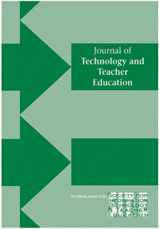 Journal of Technology and Teacher Education, 10(3), 407-422. Wetzel , K . (2001) . Toward the summit: Student use of technology . AACTE Briefs , 22(6), 5.